Get wild in the Bluebonnet Snake Print 11-inch tall women's fashion boot. The hazel brown upper is slightly distressed giving this boot a vintage feel and features a traditional gold stitching. 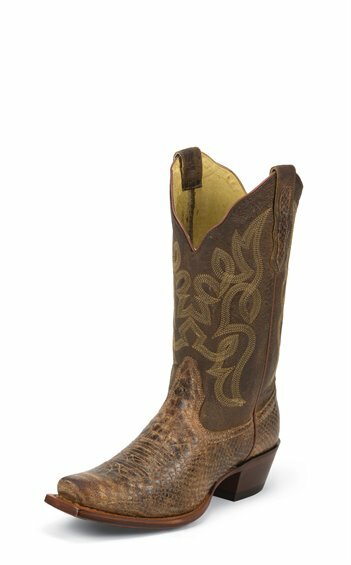 The rattle snake print foot sports a wide snip toe and elevated heel for a fashionable edge and this cowgirl boot also has a scalloped collar for added elegance. The cushioned insole keeps things comfortable whether in or out of the stirrup. Just got these. First pair of Noconas. Can't say enough. Store clerk highly recommended this brand. Awesome style, features and comfort. Great for day or night. Love the snake/cow combo print and stitching is beautiful. Highly recommend! New fav brand!